Each night starts around 8pm at the Convergence Space. Monday: No Borders: Films from Calais, with updates and discussion. Thursday: Tribes, Travellers and Resistance. 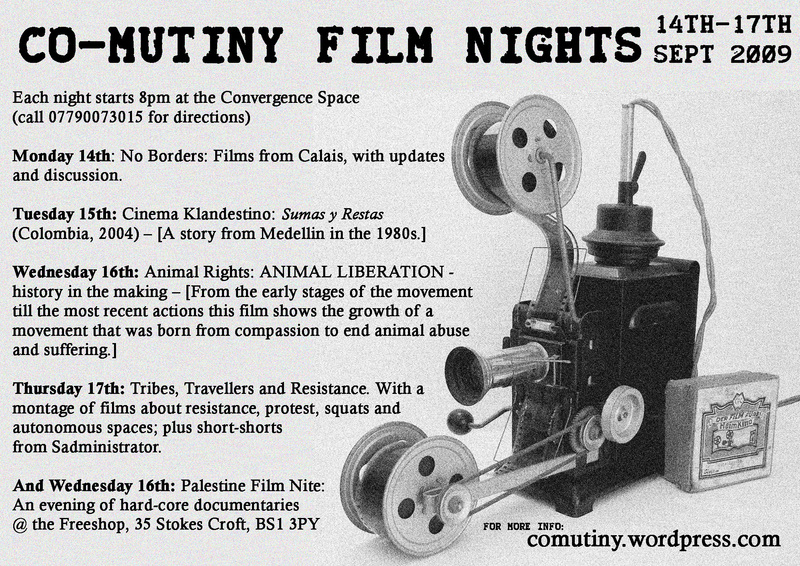 With a montage of films about resistance, protest, squats and autonomous spaces; plus short-shorts from Sadministrator . Bank, and the current construction of the Apartheid Wall. Palestine to help with the olive harvest in autumn 2007. The first video called Britches Liberation is about a personal life of a monkey rescued from a laboratory. The documented suffering of Britches is just one example of many other individual cases taking place behind closed laboratory doors. Try to put yourself in the position of Britches as you watch this video, and likewise in a position of any other animal used for vivisection, and other forms of animal exploitation you’ll bear witness to during this film night. The experiment conducted on Britches was not only morally wrong but also labeled as useless in what it was trying to achieve. But the question you need to ask yourselves is “Could any experiment, Irrelevant of its effectiveness, ever justify suffering of Britches or that of any other animal? The following footage gives an insight into A.L.F. which stands for Animal Liberation Front. A.L.F. consists of autonomous groups that believe in economic sabotage and direct rescuing of the animals as means of bringing about animal liberation. People adopting A.L.F. strategies recognize that animals are suffering at this very moment and it’s not acceptable to wait for the slow process of persuading public. They are also those who recognize portion of public will never stop abusing the animals as long as they profit from it and thus the only way to stop them is to hurt their profits. Although its activities are carried out only in form of nonviolent direct action as stated in the A.L.F. guidelines and harm to any animal, including human, is strictly avoided, A.L.F. has been classified as one of the top domestic terrorist groups by the government and is treated as such, mainly due to its successfulness. Next video is produced by SHAC USA, which is North American branch of Stop Huntingdon Animal Cruelty. SHAC is an international campaign with active branches in countries of Europe, North and South America, working to shut down Huntingdon Life Sciences, the HLS, Europe’s largest animal testing laboratory. There are 2 campaigns in support of animal rights activists who were imprisoned for their activities in connection with SHAC, the UK SHAC 9 and the SHAC 7 from the USA. For information on how to support these activists or get involved with SHAC, visit their website. You can likewise get involved directly through our collective, which is currently holding demonstrations against ASTRA ZENECA, a Bristol located pharmaceutical company dealing with HLS. Bristol Animal Rights Collective has been in a large part demonstrating against local restaurants who sell Foie Gras, the force fed duck liver. Foie Gras is illegal to produce in the UK, but thanx to free trade can be exported from other countries, mainly France. Our collective has succeeded in pulling down Foie Gras from (#?) restaurants in Bristol, making it Foie Gras free city for the moment and helped BATH activists achieve the same in their own after participating in their demonstrations. Foie Gras is an important target, because it’s based mainly within small businesses and thus is on a verge of either remaining underground or disappearing forever from our cities. Here’s a footage covering in detail the production of Foie Gras and lives of ducks involved. The last video tonight is on Hunt Saboteurs. After long campaigning, fox hunting was finally banned in UK in 2005 but it soon became clear that this ban was in itself ineffective. Not only there were reports that foxes were continually hunted but also in the rug and trail hunts, which replaced the fox hunt after the ban, fox is still allowed to be killed if hounds accidently stumble across one. Foxes can also be driven out of hiding to be shot or hunted by a bird of prey, if only two hounds are involved. As a result hunt sabotage is far from over. The hunting season is starting in September; get in touch with BARC if you’re interested in helping out. Due to time frame we’ve got tonight, I chose only a part of a whole footage but you can view the whole thing on YouTube at home.